Surely one of IGFA President E.K. Harry’s most personally satisfying accomplishments during his tenure was the development of a library for fishing-related ephemera and artifacts. 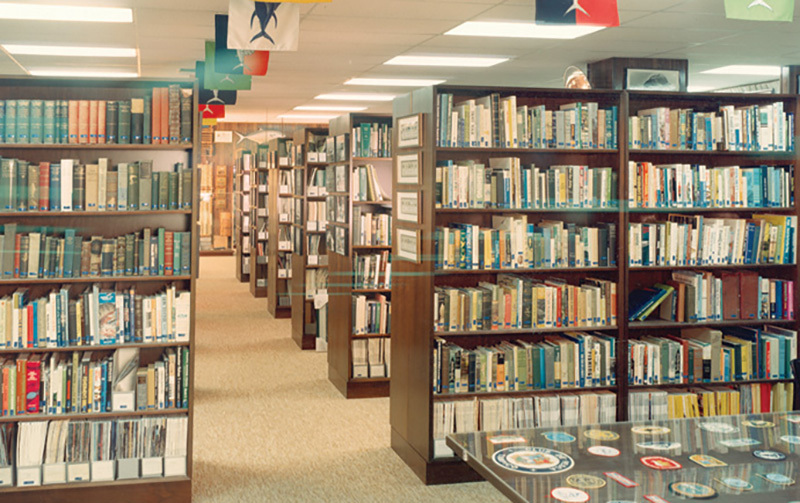 The IGFA’s International Library of Fishes had been formally started in 1973, and it quickly grew into Harry’s pride and joy. Until then, no central clearinghouse of fishing history existed anywhere in the world. Always a grand visionary, Harry saw the collection as ultimately becoming a global database as well as repository, and both goals have since been wonderfully achieved. Once his concept was approved by the IGFA Board, Harry began soliciting book collections from his many contacts and correspondents. Early gifts from Joe Brooks, Bill Carpenter, Kip Farrington, Michael Lerner, and A.J. McClane cornerstoned the collection, and subsequent donations from such personalities as Kay Brodney, Alfred C. Glassell, Jr., Ann Kunkel, Charles Mather, Frank Mather, George Reiger, and Dade Thornton enhanced it further. Harry was ceaseless in promoting the Library and was never shy in asking for donations. As the Library grew, Harry became even more proactive. He would aggressively search out and ask for copies of new books and actively collected even in categories that were only marginally relevant to angling. A pack rat by nature, Harry also bestowed upon the Library much of his own personal accumulation. Indeed, the IGFA archives throughout the Harry era are remarkably intact today, including private correspondence, office memoranda, and much original documentation from the absorption of Field & Stream. His early embrace of technology did much to aid the Library’s advancement as well, first in an early indexing of fishing periodicals and later in a massive in-depth subjecting effort not concluded until 1992. Ultimately renamed the E. K. Harry Library of Fishes and located at the IGFA Headquarters in Florida, Harry’s brainchild today includes one of the most remarkable single-topic collections in the world. Open to members and non-members alike, its reference collection has grown to include more than 15,000 books dating to 1583, several thousand films and videos from the earliest days of big-game angling, thousands of current and vintage photographs, much original artwork, and various artifacts. 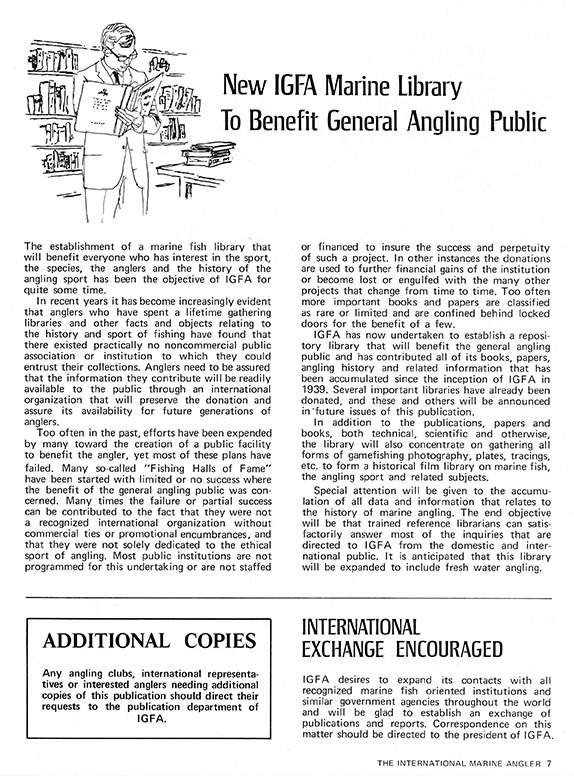 The library regularly receives magazines and newsletters concerning matters of interest to anglers around the world, and its various collections of fishing-related postage stamps, big-game tournament memorabilia, and vintage angling trophies are unparalleled. Also present is a climate-controlled rare book room where important first editions, early photographs, tackle catalogs, and smaller artifacts are stored. Were he alive today, Elwood Harry would be tickled pink.